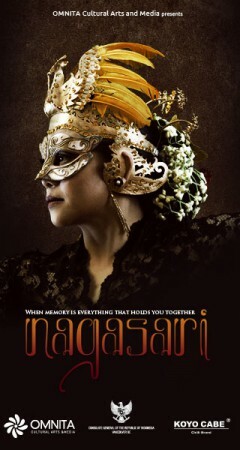 Two weeks ago I was invited to go to the second screening of Nagasari, an independent Indonesian drama film made by Indonesians in Vancouver, by a friend of mine. I was pretty excited to have another chance to see the film, as I couldn’t make it the first time, and right away I accepted the invitation. Safe to say I have quite high expectations before going to see the film, which do not really surprise me – I’ve heard good things about its production and quality through the Indonesian community in Vancouver. The movie itself tells a story about an Indonesian family in Vancouver who had to deal with the loss of a loved one, and who struggles to stay together despite grief, distance and cultural differences between Indonesia and Canada. The storyline is pretty simple: a man could not handle the death of his wife and his two daughters had to deal with grief as well as taking care of their sick father. The film, then, shows their relationship to each other, and how each person deals with their own loss, grief and burden. When I was watching Nagasari, I was drawn into this family and I felt an instant connection with the characters. It was probably because I’m also an Indonesian living and finding my way in Vancouver, but I believe it was also because the film makes the characters and their situation easy to relate to – it’s just a simple story that could have happened to any other family. Throughout the movie, I felt as if I was in the characters’ shoes, and as if I went through their emotional journey myself. I cry when they cry, and I laugh when they laugh. It was probably because the film’s use of language as well; in Indonesia, or at least in its capital city Jakarta, slang words are becoming more common to use than formal ones. In many movies, however, the formal ways to use the language are employed more often, which could make it harder for the audience to relate to the film and its characters. Nagasari, on the other hand, successfully created the balance between these two ways of talking and the film’s incorporation of some slang words made it even easier for me to relate to the story. This was something that I thought of during one of the final scenes of the movie (which made me cry buckets) – the words of the character could easily have been mine if I was in that situation. Another thing that I liked about Nagasari was its emphasis on a family living in another country completely different from their own. I haven’t seen many Indonesian movies like this and Nagasari is definitely a great addition to Indonesian cinema – it’s lovely to see that Indonesia can be seen as something other than a third-world country. The film also showed some of the most beautiful aspects of our culture, which was wonderful. Overall, Nagasari has satisfied my high expectations with its charming cinematography and direction, nicely acted characters and simple but touching storyline. I highly recommend this if you want to get into the scene of Indonesian cinema, or if you just enjoy good, independent movies in general.